Published on 22. 06. 2018 in comics and cartooning, commentary and criticism and hype & linkage. Closed Tags: Hergé, Information, Tintin. I denne uges bogtillæg til Information kan man læse min anmeldelse af den nys udsendte, nyfarvelagte udgave af Tintin i Sovjetunionen — den første historie om den unge reporter og hans hund, og den eneste i hvilken man ser ham skrive reportage! Jeg har altid synes at det album er undervurderet — det har en helt usædvanlig energi over sig, udført med overskud og er samtidig effektivt, grovkornet satirisk på den gode måde. Nyfarvelægningen er desværre totalt unødvendig og tjener kun til at dæmpe dynamikken i Hergés tegninger, der jo er udført med henblik på sort-hvid. Et tungnemt cash grab fra den belgiske forlægger Castermans side. Anyway, læs her (men: $$). Published on 11. 12. 2012 in articles and essays, comics and cartooning, culture, current affairs, film, tv, video, hype & linkage and pictorial arts. 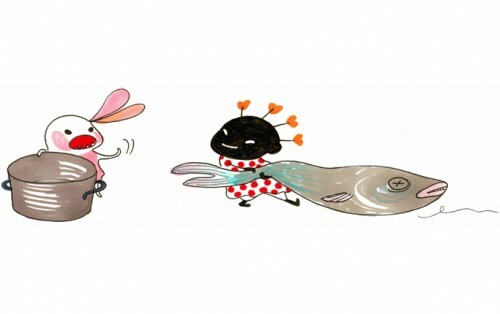 Closed Tags: Hergé, Lilla Hjärtat, Lilla Skär och alla små brokiga, Makode Aj Linde, Muhammad cartoons, Stina Wirsén, Tintin in the Congo. Over at Hooded Utilitarian, the latest installment of my very irregular column, DWYCK, focuses on recent media controversies in Sweden over representations of race: Stina Wirsén’s empoyment of pickaninny stereotyping for her childrens book and film character Lilla Hjärtat and Makote Aj Linde’s infamous cake installation at Moderna Museet in Stockholm earlier this year. The dicussion also touches upon the media kerfuffle a few months back over the projected removal of Hergé’s Tintin in the Congo to the adult section of the Kulturhuset library in the same city, as well as — inevitably — the Danish cartoons of the Prophet Muhammad. It’s a complicated set of issues that have implications of cultural integration and free speech and I’d love to hear your opinion, so pop over there and have a look. Published on 17. 08. 2012 in comics and cartooning and hype & linkage. Closed Tags: Hergé, Nummer9, Tintin. On the Danish comics site Nummer9.dk I’ve written a bunch of notes on two of Hergé’s earliest Tintin stories, the notorious Tintin in the Congo and the criminally overlooked Tintin in America as they were originally published in the early thirties. I touch upon everything from racism to humanism, from gag construction to panel composition. Unfortunately it’s in Danish, though I might try to translate it into English at some point. But yeah, now you know. Published on 02. 11. 2011 in comics and cartooning, commentary and criticism and film, tv, video. 2 Comments Tags: Hergé, Steven Spielberg, Tintin. 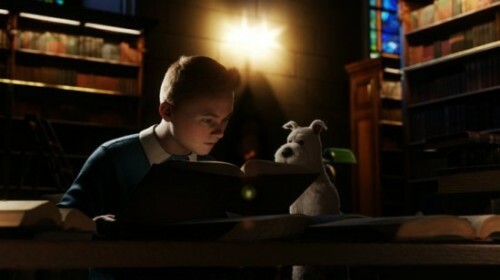 The Tintin movie makes good on the promise of not disgracing its august comics source. Spielberg is a pro and he delivers what he does best — a sense of adventure and possibility and a sufficiently sensitive approach to his film technology that his characters come alive despite the mo-cap plastic feel. The rewrite of the books (mainly The Secret of the Unicorn and The Crab with the Golden Claws) is well thought out and most of the characters are well realized, with good voice performances all round. The personal, slightly brooding and troubled subtext of Hergé’s work pretty much gets lost in the mix, but hey — this is a popcorn movie and a pretty good one.